2015 Sage Autographed Football brings the quantity as far as signatures go. The all-autograph release has a pair of signed cards per pack and 24 total per box. 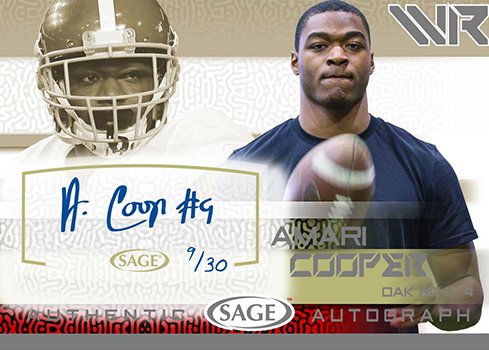 Signers for the set include many of the key offensive position players from the 2015 draft. Leading the list is first overall pick Jameis Winston. Amari Cooper, Kevin White and Todd Gurley are among the others. It is worth noting that, like their other 2015 products, Marcus Mariota is not on the checklist. 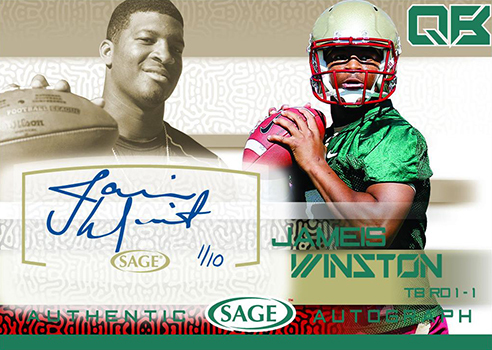 2015 Sage Autographed Football also has cards signed by some of the top 2014 rookies like Odell Beckham Jr, Teddy Bridgewater and Blake Bortles. 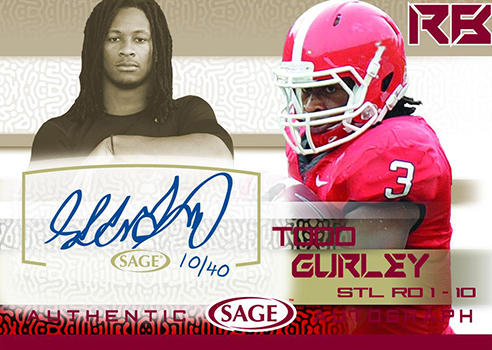 All cards in 2015 Sage Autographed Football are numbered to 40 or less. Parallels include Silver (#/30), Gold (#/20), Platinum (#/10) and Master Edition (1/1). Please note that the following images are mock-ups and not final cards. A great way to get some of the newest auto’s for about $10 each. And all cards being numbered to 40 or less is also a great addition. Most of the big rookies are in here, with some of the great 2014 rookies also included in this product.